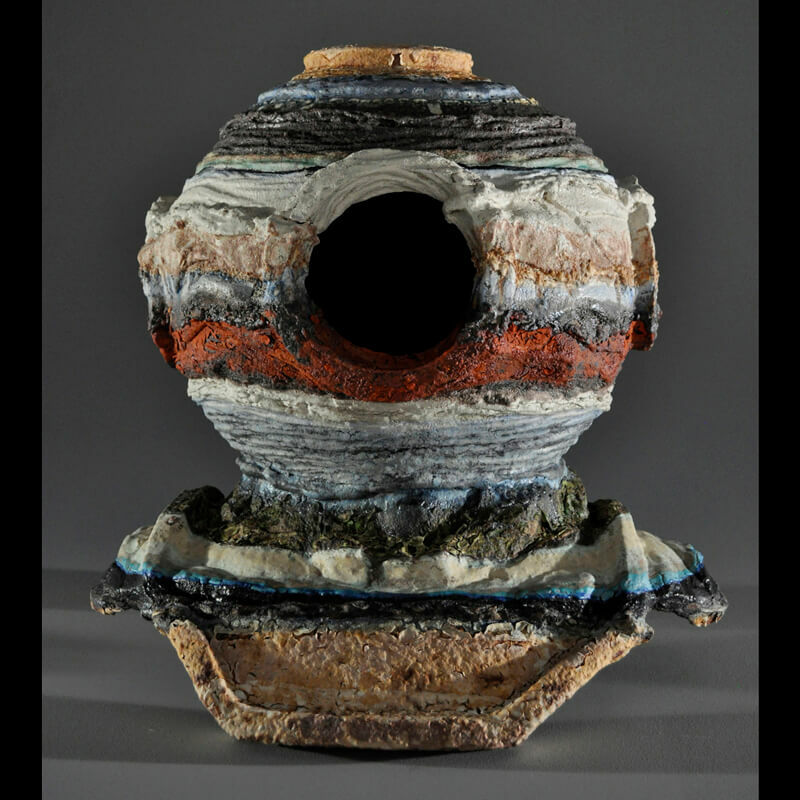 John Zimmerman received his BFA in Ceramics from Bowling Green State University in Ohio and his MFA in Spatial Art from San Jose State University in California. Zimmerman is an Assistant Professor of Fine Art at the University of New Mexico-Gallup and recently completed a year-long artist residency at the Houston Center for Contemporary Craft. Big History is a field of research that attempts to understand the history and connectedness of our universe beginning with the Big Bang and continuing through present day. This holistic approach necessitates research into varied disciplines such as cosmology, geology, biology and anthropology. By operating conceptually within these vast boundaries of time and disciplines my sculptures take on multitudes of shape and scale. Clay is my chosen medium for both physical and conceptual reasons. On a physical level, clays’ versatility and tactile qualities allow the utilization and construction of any texture or form. A variety of processes are brought to bear in each work including coil building, slab building, solid sculpting and the use of molds. Conceptually, clay exists within a geologic time scale that represents billions of years of connected history, as it is literally the broken down remnants of the earths crust. This reality allows me to make connections between the deep past (geologic strata) and present day (contemporary objects) in a way that makes the use of clay not only logical but vital. What I want the work to be is formidable, mysterious and raw…a reflection of my research, intellect and drive to make. To attain this presence, I construct contemporary objects and add to them texture and glazing patterns representative of geologic strata. This contrast creates connections that span billions of years and brings attention to humanities’ common heritage, uncommon development and shared future.